Welcome back, fans of competition from across the Blind Eternities! We have a full plate of matches lined up for you today as five different decks are battling it out to see who will be the last deck standing- and the one to represent the Turian Division in the race for the finals! Only two victories will stand between today’s Divisional winner and the Championship, and each of these decks can lay claim to a shot at it all! Without further ado, let’s look at today’s contestants. Naya Domain is the odd man out in a very challenging field- it’s the only representative from its respective set, while the others have two apiece. 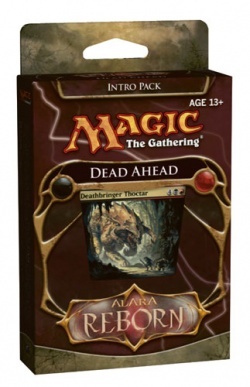 The Alara Reborn decks may have a slight advantage over their earlier peers in that they’re more-focused, two-colour versions with a whole set to choose from. Both Chandra’s deck and the Demonic deck are from Duel Decks, and will feature a higher than usual power level, most visible in both the deck’s focus and in its number (and quality) of rares. Still, as we’ve seen before, nearly anything can happen when the battle begins. Let’s take a closer look at our contenders! Detail: Like Dead Ahead, Rumbler takes the colours in common from two merging shards and hammers them into a more focused, powerful deck- in this case, Naya and Jund. With a solid burn suite, behemoths, devouring creatures, and plenty of fodder, Rumbler is a multi-tool threat that will be hard to beat! Have your favourites picked yet? It’s time for battle! A turn-2 Fireslinger and turn-3 Oxidda Golem give Chandra a solid early start, who then adds an Inner-Flame Acolyte for even more. 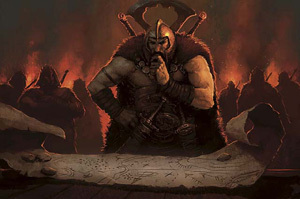 Naya- who’s already at a disadvantage with a mulligan down to 6- leads with a Rampant Growth to develop its manabase, then follows up with an Aven Trailblazer. Naya just can’t seem to mount a successful defense as Chandra’s creatures pour on the damage, and Chandra finishes Naya off with a Flame Javelin and Fireblast. Another flameout for Naya, which fares only slightly better this time with a Matca Rioters, Aven Trailblazer, and Spore Burst for 3 after a promising start with a Woolly Thoctar. The Thoctar never gets a chance to hit- a Flame Javelin sees to that- and its followed up by another turn-3 Oxidda Golem and an Inner-Flame Acolyte. Chandra ups the temperature with a Firebolt, Fireball, and Seal of Fire within two turns, and advances to the next round! Demonic hits hard early, Dark Ritualing out a turn-2 Abyssal Specter. It doesn’t last long, though, as Dead Ahead topdecks a Terminate before it has time to do too much damage. Demonic plays a Foul Imp, then drops a Breeding Pit to buy time for its expensive, Demon-infested hand. Dead Ahead unleashes a small but steady stream of beats on the other side of the table- a Viashino Skeleon with a Leonin Scimitar, a Dreg Reaver, and Sanity Gnawers. A Blister Beetle kills off its only remaining Thrull token so the Cruel Edict can claim the Imp, then Dead Ahead grinds in the win. Demonic looks for the stall game, trading an early Demon’s Jester for a Dregscape Zombie. Dead Ahead, meanwhile, looks to live the dream with a Singe-Mind Ogre hitting something fat like a Kuro, Pitlord… but only winding up hitting a Swamp. Demonic battles back with a Reiver Demon off of a Dark Ritual (killing a Viashino Skeleton), but it draws a Terminate right away. A 7-point Corrupt keeps Demonic up a bit, but the Leonin Scimitar-wielding Ogre and a surprise Igneous Pouncer get in for exactly lethal. Chandra has a strong early presence with a Furnace Whelp in the air, a Flamekin Brawler on the ground, and Chandra Nalaar herself leading the troops. Rumbler lands a turn-2 Elvish Visionary followed by a turn-4 Spellbreaker Behemoth, but the Behemoth is immediately felled by a freshly-summoned Chandra and a Fireblast. This advantage is only temporary, though, as Chandra comes under surprise pressure with a Bloodbraid Elf (cascading into Dragon Fodder). The Elf draws a second Fireblast to kill it (Chandra’s glut with lands) and protect the planeswalker, but a Colossal Might on a Goblin token is enough to see Chandra off. A second Dragon Fodder helps fuel a 13/13 Thunder-Thrash Elder, who steals the game for Rumbler. Two Terramorphic Expanses in its opening hand give Rumbler a fighting chance to take advantage of Chandra’s mulligan (to 6). Early plays like Godtracker of Jund, Tukatongue Thallid, and Elvish Visionary fall afoul of a Seal of Fire and a Fireslinger. Chandra’s back is broken, though, when a Spellbreaker Behemoth hits the table. When it attacks, Chandra pings it with the Fireslinger and goes for the finish with a Fireblast, but a timely Colossal Might saves it (and ramps up the damage). Chandra’s Oxidda Golem supplies some damage, but falls to an Incinerate (O sweet irony!). The game is won when a 1/1 Saproling (from the Thallid) attacks alongside the Behemoth. The Behemoth is chumped, but the Saproling pulls a Sangrite Surge and becomes a 4/4 double striker. A surprise upset, Chandra has been bounced from the tournament! Dead Ahead leads off with a Viscera Dragger in a game that’s slow to start for both sides. Rumbler’s turn-4 Bloodbraid Elf cascades into a perfectly-timed Incinerate to clear the way through the red zone, and is joined next turn by a Blitz Hellion, brutalising Dead Ahead. Dead Ahead landcycles an Igneous Pouncer to fuel a Monstrous Carabid, but lets the Bloodbraid Elf through, fearing a combat trick. Rumbler doesn’t disappoint- there’s a Sangrite Surge- and the Elf claims the first game for Rumbler! Another slow start, Rumbler’s first creature is a turn-4 Algae Gharial which gets sniped by a Cruel Edict. Dead Ahead has a quicker start with a turn-2 Blood Cultist, but the Cultist falls to an immediate Shock. Dead Ahead’s Rhox Brute pours on some hurt, drawing a gang-block from a Blister Beetle and Singe-Mind Ogre, but a timely Colossal Might keeps it upright. A bitter blow, but Dead Ahead can take some solace in the fact that the Ogre nailed a Sangrite Surge when it came into play, dealing 6 damage to Rumbler. Once the Rhox Brute gets Terminated, Rumbler is finished off by a Carabid/Viscera Dragger tandem followed by a lethal Breath of Malfegor. It’s gone to Game Three, and the winner will be our Turian Division champion! Rumbler has a promising start, playing a turn-4 Spellbreaker Behemoth followed by a Gorger Wurm. The Wurm then gets terminated, though, and the Spellbreaker is felled by a Cruel Edict. Meanwhile, Dead Ahead has managed a Blood Cultist, but it draws an immediate Shock. Dead Ahead’s Singe-Mind Ogre again hits paydirt, drawing a Vengeful Rebirth for another 6 points of damage to Rumbler, but in a moment of poetic justice the Ogre is killed by the Rebirth when the Spellbreaker Behemoth is returned to hand. The Spellbreaker Behemoth is replayed alongside an Elvish Visionary, but Rumbler has no defense for Dead Ahead’s Lightning Reaver. After the Reaver’s second attack, Dead Ahead shows the Breath of Malfegor and claims the glory. Your 2008-09 Turian Division Winner! 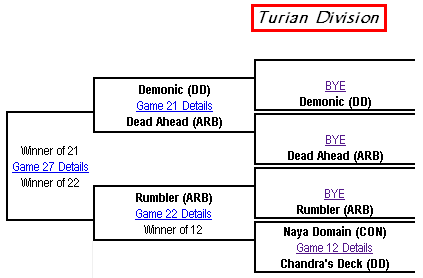 Whoa, never expected to see neither Chandra’s nor Demonic at finals. Rumbler is a nice deck, cheap and aggresive creatures like the Spellbreaker or the Hellion, but Dead ahead’s removal suite is solid enough to give it a great advantage over classic creatures precons. On the other hand… Rumbler also has a good set of removal (though only direct damage), plus pump spells, he could have also won. That’s a great catch. From time to time, we have the occasional ‘RTFC’ misplay, which I can only attribute to constantly playing with different cards. They’re always regrettable, especially when they prove to be a deciding factor in games. We jokingly refer to the awards for such finds as “no-prizes,” in the great Marvel tradition, so congrats! Was happy to see Chandra get rumbled by the Rumbler after she defeated my championship pick. Was expecting a little more fight from Demonic though. Boy the finals was the only 3 game match? The Breath of Malfegor must have been really foul from eating Demonic in the earlier match up. Quite interesting. Chandra got stomped out. Didn’t expect Demonic to go anywhere. Nice to see Breath of Malfegor shine a little. Once again, I’m totally flabbergasted by the results. I thought for sure Chandra was going to go the distance. Instead, she didn’t even win her own division. I guess that’s why I took the foil copy out and put it in with Fire and Lightning. Now, that deck is on FIRE! That’s not a bad idea. o.O Why didn’t I think of it. Though I’d have to put in some Seething Songs or something. Would want Chandra out before T5.